Michael and Laura Cote usually attended an early Sunday Mass at their Dracut church, but this past weekend was supposed to be special. 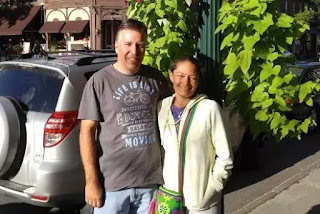 The deeply religious Methuen couple had plans to visit friends at Seabrook Beach in New Hampshire, so they attended an afternoon Mass on Saturday instead. “I’m sure it was because they were going to go away on Sunday,” said Michael Tompkins, a deacon at Saint Francis of Assisi Parish . That Saturday service was the last time their fellow parishioners got to see the couple at the church, which they were deeply dedicated to. Michael and Laura Cote were identified Monday as the victims of a powerful rip current that swept them out to sea at Seabrook Beach on Sunday afternoon, killing them and leaving four other swimmers uninjured. A lifeguard, police officer, and bystander rescued the swimmers from the choppy waters over the course of an hour, witnesses and officials said. People at the beach recalled a tense, chaotic scene, as waves tossed the swimmers around. As noon approached Sunday, spirits on the beach were high, beachgoer Alexa Jelley said, as the sun came out about 11:30 a.m. and temperatures reached the low 70s. The water along the beach usually looks like a “sheet of glass,” she said, but was strangely choppy on Sunday. Waves reached 3 to 4 feet high, and the beach was listed as “low risk” for rip currents, John Jensenius, a meteorologist with the National Weather Service, said.